The midsummer sun hung in the azure blue sky like a red-hot ember ejected from a campfire. Three anglers sat in the dappled shade of the streamside cottonwood trees waiting for the sun to drop behind the western hills and bathe the valley in the cool of evening. Throughout the heat of the late afternoon they languished in the shade, heads nodding, occasionally waving a hand at an offending fly or moving slightly to remain in the welcome shade. All of nature seemed to be lulled into inactivity during the heat of the day, and except for the occasional shrill of a cicada or the snap of wings of a grasshopper, all was still. The nearby stream flowed passed, its surface an azure blue reflection of the sky, and slick and smooth like oiled metal. The denizens of this watery world were equally languid under the heat of summer sun, and even the minnows and fingerlings sought solace in the cooler water of the deeper pools. The murmur of the water running from pool to pool over the shallow riffles seemed muffled and still in the heat of the day. Slowly, nearly imperceptibly, the glowing orb edged toward the horizon, and shadows gradually extended across the valley floor, like cool fingers reaching from the base of the distant hills. The hot air trapped in the valley began to rise, and the first breeze of evening stirred the grass and rustled the leaves of the cottonwoods. Anglers stir beneath the trees, wiping the sleep from their eyes, stretching lethargic limbs into activity as the magic hour advances across the meadows. The rising columns of air stir the atmosphere, and in response clouds begin to form, rising quickly upward. In the distance the faint glow of heat lighting illuminates the face of a building summer thunder storm. The stream is bathed in the cool shadows of approaching evening. Swallows appear, swooping and diving over the water, their twittering calls and erratic flight indicates the presence of insects, mayfly spinners and smoke-like columns of midges merge in the gathering twilight providing a moving feast for the winged predators. The anglers gather their gear and move off to take their places in preparation for an anticipated rise of trout. Already the first insects are dropping down to lay their eggs and soon the surface will be broken by the noses of rising trout, eager to fill their stomachs with the bounty. The insects are small and the best trout occupy the most advantageous places where the currents funnel food to them. While the younger fish may expend their energy chasing from morsel to morsel, the larger fish quietly sip away at the bounty delivered by the stream. Rhythmically they stick their nose up through the surface film and inhale the delicate morsels, unwilling to move to the left or the right they single-mindedly and doggedly pursue their purpose of maximizing their intake of food, and minimizing their expenditure of energy. Holding close to the surface their view of the world is limited to an area just in front of their nose. Items outside of this window pass by unseen. At the tail of a long pool a large brown trout slips out of the depths, and moves into the shallow water next to the bank. Within several inches of the bank the big brown settles into a slight depression in the stream bottom. Slightly upstream two large rocks squeeze the water between them concentrating the drifting insects into a narrow strip just a few inches wide. This narrow current tongue carries its bounty to the waiting trout, and as he tips up to feed, only a slight bulge in the surface betrays his presence. One angler has selected the pool for his evenings angling. He enjoys the challenge of small flies, light tippets, and pinpoint casting. This is a game of millimeters, and success is measured not by the number of fish caught but by the number of fish fooled. The more difficult the lie the more satisfaction gained by getting a successful drift, and persuading the trout to rise to the fraud. Timing and accuracy are the skills necessary to produce results under these conditions. Smaller trout staked out their positions along the tail of the pool, and for several minutes the angler stood along the shore surveying the risers. A few yards from shore a weed bed provided a break in the current, and two respectable trout had taken up positions on its lee side concentrating on the drifting insects that were deflected along each side of the submerged weeds. Within minutes the angler had hooked and released one of the fish, a fine brown of 14 inches. The commotion created by the brief but spirited battle had momentarily caused the other trout to move back into deeper water. The angler stood silently watching for the telltale sign of another rising fish. Along the bank the big brown continued his methodical feeding rhythm. The current carried the ever-increasing bounty of small mayfly spinners drifting into his waiting maw. A small caddis fly fluttered into the flow and the fish slashed at the fly as it ricochet across his field of view. The splash created by his movement caught the ear and then the eye of the angler, and as he watched the spot he noticed the slight bulging of the surface as the brown resumed sedately feeding on the small spinners. This was what he had hoped to find, a selectively feeding trout holding in a difficult lie. For several minutes the angler watched the trout feed. As he fed the only part of his body that showed was the end of his nose, and the angler could see that the trout below the nose was very respectable. Mentally the angler noted the intervals between each time the trout fed, and carefully observed the exact location of each rise. The tongue of current that was carrying food to the trout was barely an inch wide where it passed over the trout. Just upstream several long strands of grass trailed in the current making the situation even more difficult. 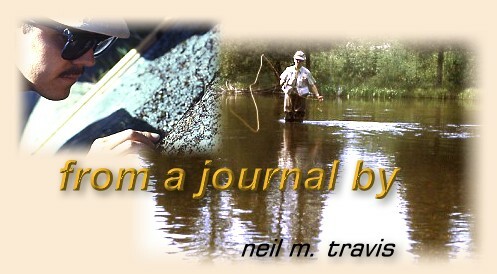 The distance from the trailing grass to the rising trout was just a matter of inches, and for his fly to float precisely over the rising trout it would have to settle precisely in front of the trailing grass, float downstream on the current without any drag, and arrive at the precise moment the trout chose to rise. After several minutes of careful observation the angler moved slowly into position. He needed to be as close as possible so he could have maximum control over his cast. Being careful not to create a tell tale wave or to crunch the gravel beneath his feet he spent several more minutes getting into position. He was aware, with each passing moment, increasing of darkness was making it more difficult for him to see his target. Finally he was in position, across and slightly downstream of his target. He checked his fly, stripped line from his reel, and began to cast. His first was short, but he allowed it to drift well beyond the rising trout before he picked it up. Shaking the water from his fly, he extended the cast slightly, and it dropped right in the center of the flow; it floated by untouched. The trout rose, and again he presented his fly, and again it was untouched. The angler hesitated, trying to get into the trout's rhythm, but each time he cast the trout either rose before his fly arrived or after it had passed by. Darkness was increasing, and still the trout continued to feed. Bending low to the water so he could see his fly, the angler made one final cast. The fly landed just above where the trout was holding; the water bulged and his fly disappeared. As the hook found its hold in the trout's jaw, the water erupted and the big brown somersaulted out of the shallows and made a long rush upstream. Willow whips cut by the resident beavers grabbed at the thin leader. The angler tried to hold the line out of the water but the trout quickly sped upstream, and then rapidly reversed his direction. The leader snagged on a willow stub and as the trout raced back toward the angler it snapped.